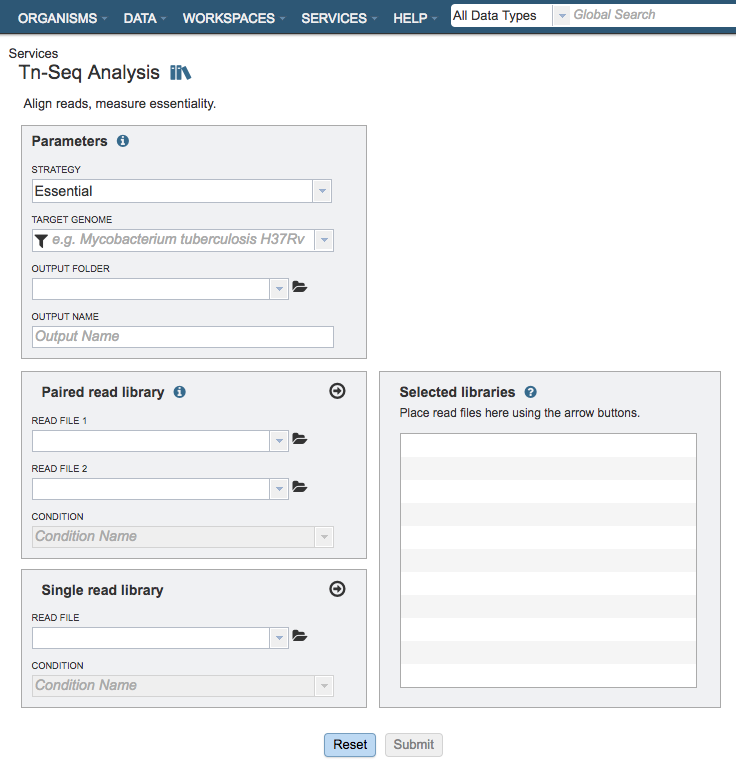 The Tn-Seq Analysis Service facilitates determination of essential and conditionally essential regions in bacterial genomes from data generated from transposon insertion sequencing (Tn-Seq) experiments. Tn-Seq (in the broad sense used here) refers to a family of related methods that use deep sequencing to survey a transposon insertion library and quantify the abundance of insertions at different sites in the genome. DeJesus, M. A., Ambadipudi, C., Baker, R., Sassetti, C., & Ioerger, T. R. (2015). TRANSIT-a software tool for Himar1 TnSeq analysis. PLoS computational biology, 11(10), e1004401. 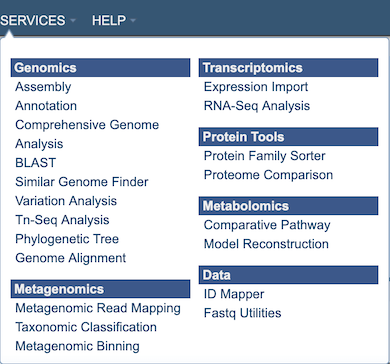 The Tn-Seq Analysis submenu option under the Services main menu (Genomics category) opens the Tn-Seq Analysis input form (shown below). Note: You must be logged into PATRIC to use this service. This parameter determines whether the genes are determined to be essential in a single condition or by comparison to a control. Essential: Runs the TRANSIT software. With this strategy selected TRANSIT will calculate the probability of being essential using the Gumbel or Extreme Value distribution. Conditionally Essential: Runs the TRANSIT software. With this strategy selected TRANSIT will operate in “resampling” mode and use the difference between the sum of read-counts in each condition to calculate the probability of being essential. The group/condition specified will be used to determine contrasts in the conditionally essential mode. Reads assigned to the same group will be used as replicates. Choose whether the sample is a treatment or control. Read files placed here will contribute to a single Tn-Seq analysis. Read files placed into this table under the same condition will be considered replicates.